NAVIGATOR has become the premier flagship herdsire of our breeding program. 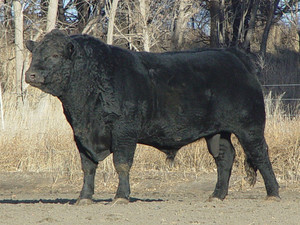 He was shown 3 times in Denver and was named Calf Champion Bull in 2004, a class winner in 2005 and Reserve Senior Champion Bull in 2006. Even more impressive have been the contributions of his progeny to our program. His first calving daughters look outstanding with lots of milk and nicely designed udders. With a significant number of progeny scanned in 2006, NAVIGATOR is now among the top 10 bulls of the breed for marbling EPD with the one of the top accuracy values among that group.